Big Canoe Lodge – the name says it all. The gleaming canoe suspended over the great room represents the best of what the North Georgia Mountains has to offer. 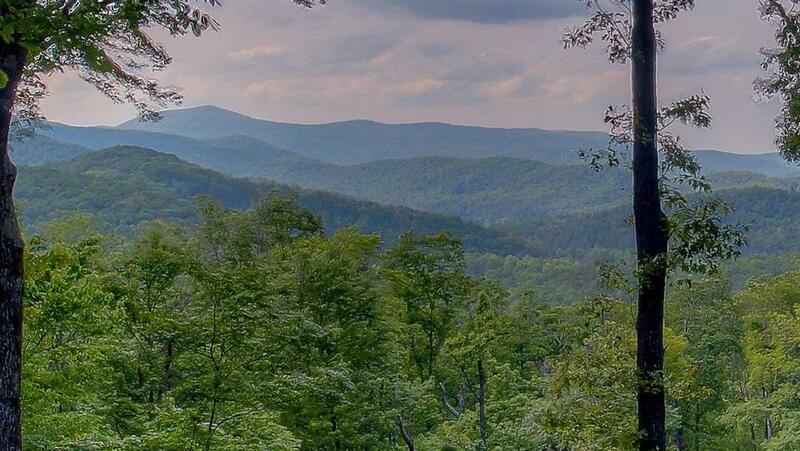 Here, nestled deep in the woods, you’re connected to the streams, lake, and rivers around you, situated on two acres of land with gorgeous long-range vistas. If you’re looking to hang your “Gone Fishing” sign, this is your dream destination. This beautifully appointed North Georgia cabin rental, with maple hardwood floors and striking architecture, is professionally decorated with comfort and style throughout. You’ll feel surrounded by nature in every room, with wildlife and forest-themed accents like the locally crafted antler & wagon wheel chandelier in the dining area, wooden “bouquets,” the colossal antlers adorning the double-sided stone fireplace – even the bathrooms have the authentic lodge look with antler lighting and Aspen bark mirrors. Have your morning coffee on the cozy screened-in front porch with the sunrise and floor-to-ceiling windows provide breathtaking mountain views. When everyone’s ready to head to the river, grab your gear and go. From incredible trophy fishing to swimming and tubing, kayaking and of course canoeing, your days spent in the water will float blissfully by. After an exhilarating day of outdoor adventures, soothe sore muscles in the dry sauna, or head out to the hot tub for a nice long soak. Make dinner in the stylish gourmet kitchen and you won’t miss a minute of conversation – the island seating area allows the gang to keep you company while you prepare the day’s catch to share indoors or outside among the trees. There’s plenty of room on the 60-ft. deck for everyone to enjoy the million-mile views. After dinner, snuggle up around the deck’s fireplace while watching the outdoor TV, head down to the fire pit for marshmallow roasting, or simply relax on the porch swing with a glass of wine. Kids young and old will enjoy playing pool in the game room. There are also board games, chess, checkers, and Wii to entertain the crowd. Upstairs, the loft area can host the perfect sleepover party with bunk beds, a pullout sofa, seating area with TV, and even its own full bath. On the main level, the luxurious master bedroom suite will treat you to a sumptuous Aspen canopy bed, double-sided fireplace, walk-in closet, and steam shower. Step onto the balcony for a last look at the stars. The main floor’s queen bedroom has a hand-carved log bed and a full bath. The first level also offers beautifully appointed king and queen bedrooms. Here at Big Canoe Lodge, you’ll feel at one with nature, in the middle of an awe-inspiring wildlife highway. How soon canoe get here? Bedrooms - master suite on main level with Aspen canopy king bed, walk-in closet with built-in, gas fire place, night stands, lamps, chair, 30" flat screen TV, private bath, double doors open to balcony; guest room on main level with queen branch bed, night stands, lamps, nearby dry sauna; downstairs with queen bed, night stands, lamps, rug, 30' TV; second downstairs bedroom off game room with king bed, night stands, lamps, armoire. This bedroom is not private off game room. 03/19 - Big Canoe was awesome! The living area and kitchen were huge with plenty of room for our group. Kitchen was also well stocked with all the items you need to cook for a large group. Bedrooms are large enough and beds were comfy. Everyone we spoke to or had personal interaction with from Escape to Blue Ridge was great! They made sure we had everything we needed or expected. We had a door that was stuck and someone was there within the hour to fix the problem. 03/19 - The house was very clean and inviting and everything you would need was available. The scenery was amazing and the outside seating areas are so relaxing. The staff was very nice and helpful from the initial phone call in December with the booking process. I was so thankful they suggested I did not drive the 12 passenger van and they were correct. 01/19 - We all enjoyed our stay here to the fullest. From the view to the interior it was absolutely stunning and relaxing. We definitely want to return already. 01/19 - We enjoyed the space and kitchen appliances and utensils and the view. 01/19 - Well equipped and homey with plenty of space. Amazing service!! 12/18 - Beautifully built--with lots of amenities, including the pool table. Very enjoyable. 10/18 -Great view and enjoyed the layout of the cabin. 10/18 - Everything about the home/location was beautiful! The company overall is amazing. They made a birthday party very special and made beautiful memories. Will be using this company way more now! 10/18 - The space and vistas were great! We've had good experiences with the company. 08/18 - Our favorite features of the home were the spiral staircase with built in bookshelf, the canoe resting on the beams, and of course, the view. Great! 08/18 - The cabin was all that I could possibly dream about. I loved the porch (back) and enjoyed every morning and evening there. 07/18 - Layout was great. 06/18 - I enjoyed the location, the decor inside, the games and the items that were available to us. The communication is great. Booking was easy. Follow up was awesome. Thank you! 06/18 - The view from the cabin was incredible. Great cabin, great company, great time had by all! 09/17- The cabin was very spacious and the attention to detail in the decor was amazing. It felt very homey for such a big space. There were throw pillows galore inside all of the rooms. The gas fireplaces were a real treat. I was impressed every step of the way with the EBR team. Very professional and super quick responses. When we first went to put our garbage in the trash cans they were already full, and they had someone come out on a Saturday within the hour to empty them. Thank you for everything! 04/17- Large, beautiful, comfortable home, very quiet and lovely view. The company is very thorough and organized. 02/17- The cabin was fully stocked with everything needed for a few days. As suggested, bring extras for anything you may need for a longer stay. The company was very responsive to any questions that we had prior to the reservation date. 01/17- There was plenty of room for all of my family. The cabin was very clean. Very impressed. Will use this company again. 01/17- Beautiful cabin and very spacious and homelike. It was very welcoming and comfortable and beautifully decorated. The Christmas decorations were elegant and just right. Great place to be with a large family. 10/16- Beautiful view, spacious cabin with lots of features, excellent selection from Direct TV. Very service oriented company. 10/16- Great deck......kitchen well stocked. Your company is very good. We have dealt with you for several years. 10/16- The cabin was beautiful, the view was amazing and the location was great. I will definitely be booking again next year. Everyone I dealt with was extremely professional and helpful. All of our guests were thrilled with the cabin. 07/16- Loved the view sitting at outdoor fireplace on the deck. The fully equipped kitchen made family dinners a breeze. 04/16- The outdoor living room and fire pit! The house had a warm feeling that made us feel comfortable as if it was our own. The open floor plan made it feel like we were still all together even if in different parts of the house. From start to finish everything was handled perfectly. I will use your services again when returning to this area. 03/16- It was a nice size cabin. We had enough entertainment for everyone. 01/16- The seclusion, the accommodations, fantastic view, the balcony were favorites. The cabin is spacious and love the spiral staircase. 01/16- The coziness of being together in a beautiful clean cabin was breath taking. Thank you for calling and giving me updated details pertaining to the condition of the cabin after the storm. 11/15- View of the surrounding mountains. 11/15- Appreciated the two-sided fireplace and the space the Blue Canoe cabin offered. 09/15- The view was so much better than pictures & description. The privacy was great. The floor plain of the home was fantastic. The homes furniture & decorations had a nice mountain feel. There were French touches and some items of sophistication which gave a really nice balance to the carved bears & casual mountain pieces. Home was picked for the king master bed & brouquce mirow over the fire place and we were not disappointed. For the price having the steam shower & sauna was delightful. The quality & size of living room TV was a nice surprise. We were treated well, all questions answered, all problems resolved quickly. The quality of towels, bed linens, bath supplies, and atmosphere set upon our first entering the home showed a level of excellence we appreciated. Enjoyed the information provided by your companies emails before and after our visit. Thank you for your professional team who contributed to our enjoyable stay. 08/15- I loved the view as well as the home in general. It was just beautiful. Your company is very nice. I received a lot of help with making the reservation and they were not scared to give me a call or email me. 07/15- We enjoyed the views from both the back deck and front porch. Great to relax with a cup of coffee. Loved all of the dishes, I love colorful fun dishes. Plenty of things to do even when inside on a rainy day. Decor was great. Their was enough top of the line linens and the bedroom setups were perfect for us. We had from myself, 69 year old great-grandma to youngest 18 month old and all ages in between. Great Cabin. We have shared pictures with many friends. Including my friend the bear just outside the front porch one morning. This is the third time we have rented from your company and have never had a problem. directions are great, and at Christmas when we needed wood, one call and it was delivered in an hour or so. 06/15- Loved the peaceful setting & the homes decor was very nice. 04/15- This house was a "10" all the way. Absolutely beautiful and extremely comfortable. We have used Escape to Blue Ridge for four rentals over the last few years and they truly have their act together. Everything works as it should. 04/15- Loved it! Probably our favorite (this is our 6th trip). Infact, we want to book this same cabin again this summer....BUT, the only thing and it's kinda a big thing...the air is set to not go any lower than 72, although it was cool and we didn't need it this trip....our daughter has a certain type of asthma and we must leave our air at home to 68 at all times. In the summer we'd have her with us, can this be adjusted? 03/15- Open great room, kitchen and dining were perfect for our group and the fireplace on the deck and views were fantastic.Lovely place! 10/14- The view and the kitchen. What a wonderful space. Lots of room to gather and relax. Very professional and personable staff. Very knowledgable on cabins and local area. Easy to navigate website. Many fine attributes of cabin not photographed. 10/14- The seclusion. Good house layout. The luxury towels. 09/14- The fireplaces were our favorite part but the entire cabin is wonderful and a good time was had by all! 08/14- The out door fire place is my favorite feature. Relaxing in beautiful, serene outdoors. Adventure around every corner. Simply a great family getaway. 07/14- Favorite features were the large kitchen cooking area, outdoor fireplace seating area, master bedroom space, loft area, dining for all 10 of us at one table. The view!! The great room space when we arrived with the canoe is just beautiful. The steam shower is a cool feature. We loved having a wii for the kids to use. A great spacious, clean cabin with lots of entertainment provided and with a great view. A little far out and secluded. Good, timely info provided. When dishwasher didn't work the problem was rectified immediately. Cabin was fabulous. All amenities were excellent. Appliances top-notch, views spectacular. There was a leak in the dehumidifier before we arrived, had been repaired but downstairs carpet should probably be replaced soon. Beds very comfortable. Staff was very helpful with info, directions, etc. I want to especially thank Kathy, and Denise (if I omit anyone, I apologize in advance). They were so helpful and supportive when I was in the midst of a medical work-up from previous cancers. Thankfully, that was a false alarm and made my week on Black Ankle mountain that much more enjoyed.